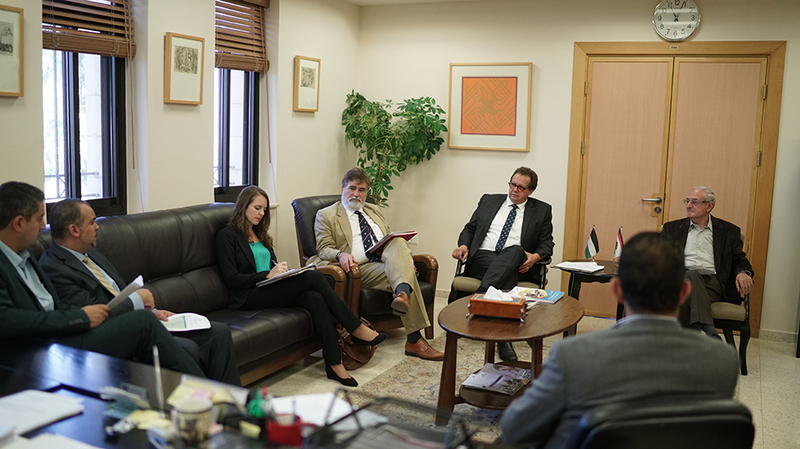 After reopening its regional office in Amman, Jordan, Director of the Canadian International Development Research Center (IDRC) Jean Lebel and Representative of Canada to the Palestinian Authority Douglas Scott Proudfoot visited Birzeit University to explore opportunities for expanding the partnership with Birzeit University. IDRC funds research across a wide of areas, including health, technology, gender, and economic empowerment to achieve inclusive and sustainable development. The IDRC has had a long-standing relationship with Birzeit University since the eighties. Lebel and Proudfoot met with Birzeit University’s Vice President for Academic Affairs Henry Giacaman, Vice President for Community Affairs Asem Khalil, External Academic Relations Officer Amir Khalil, Director of the Center for Continuing Education Marwan Tarazi, Director of the Institute of Community and Public Health Rita Giacaman, Head of the Learning Innovation Unit at the Center for Continuing Osama Mimi, Director of the Muwatin Institute for Democracy and Human Rights Mudar Kassis, Director of the Ibrahim Abu-Lughod Institute of International Studies Dr. Lord Habash, Jamil Salem, an academic researcher at the Institute of Law, and Hosnia Jad from the Department of Philosophy and Cultural Studies. 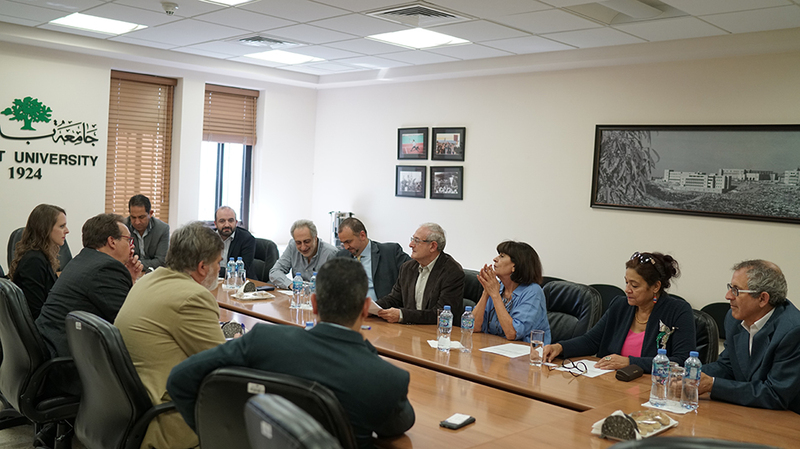 Both parties assessed the ongoing projects conducted with Birzeit University, looked into the challenges that face researchers and research implementation in the region, and explored opportunities for more projects for development within the region and local contexts. Giacaman and Khalil expressed their excitement at the reopening of the IDRC offices in the region. The IDRC, according to the vice presidents, has played a vital role in supporting research and building leaders and scholars who are able to generate more knowledge and practical solutions to reach a durable peace. 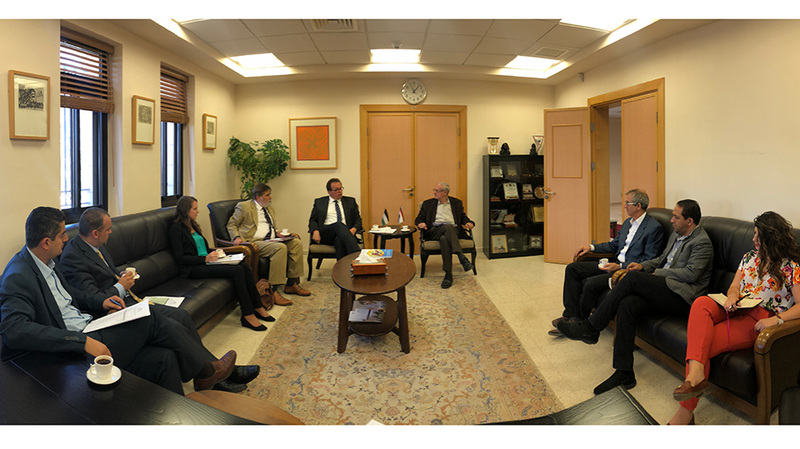 Lebel reaffirmed the IDRC’s commitment to a strong regional presence by supporting research projects, with a special focus on Palestine in subjects that are relevant, practical, and sustainable. The IDRC is currently funding a project entitled “Empowering Palestinian Girls through Digital Learning Innovations in STEM” with the Center for Continuing Education. The project aims to understand the conditions needed to enhance the capacity of the education system in Palestine to improve the accessibility and quality of education through digital learning innovations. In addition, the center funds a project on the reproductive health needs of Palestinian adolescent girls from refugee camps with the Institute of Community and Public Health. The research project depends on qualitative and quantitative research methods, focusing on understanding and highlighting the reproductive health needs of refugees in the West Bank and Jordan.